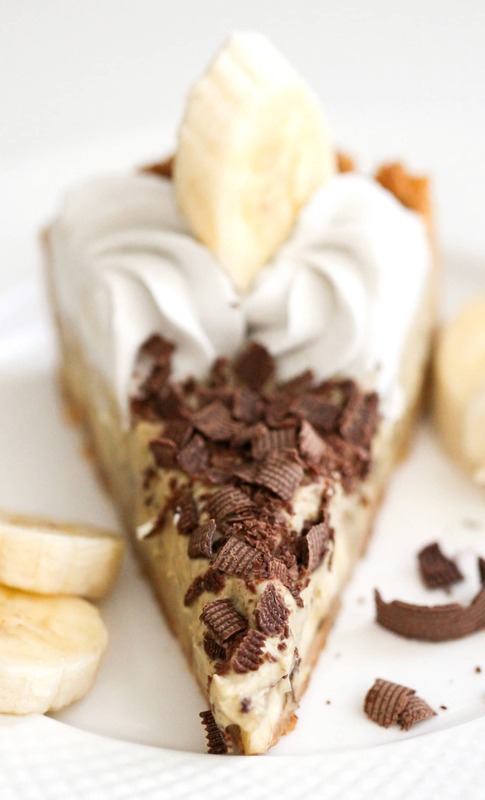 A few years back, a lovely reader requested that I make a Healthy Banoffee Pie. Before reading her email, I have never tasted, let alone heard of, Banoffee Pie. From what showed up on my Google search, I seriously wondered why that was. It’s basically the best pie flavor known to man. It’s got bananas, toffee, cream, chocolate, a bunch of sugar. Sounds nom-nom-nom yummy, yes? Well, it does until you calculate the calorie count at least. This pie was in desperate need of a healthy makeover. I was on a mission to make the pie without butter, sweetened condensed milk, heavy cream, corn syrup, etc. Despite how challenging that sounded, I couldn’t wait to make my own version and have such a delicious pie in my very own fridge. 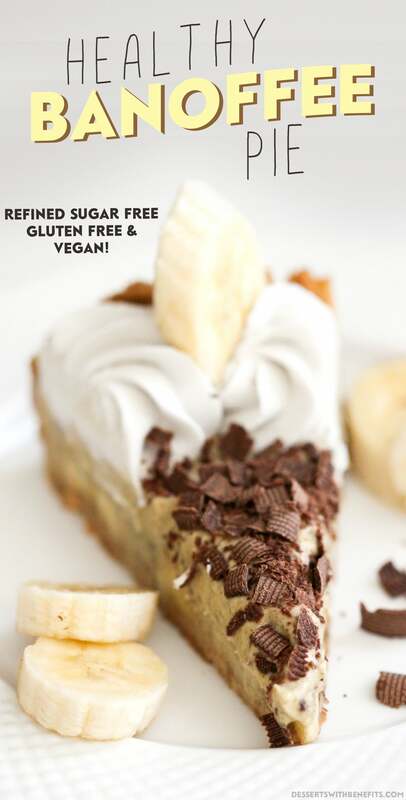 Surprisingly, this Healthy Banoffee Pie was a success on the first go (woohoo, we can skip the trial-and-error talk)! 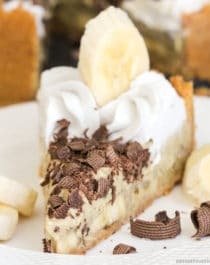 The crust is thick and full of graham cracker flavor, the filling is smooth and creamy with the perfect amount of banana, and the whipped “cream” is fluffy, light, and decadent. Oh, and the shaved chocolate topping? Mmmmm… that took this pie to another level. 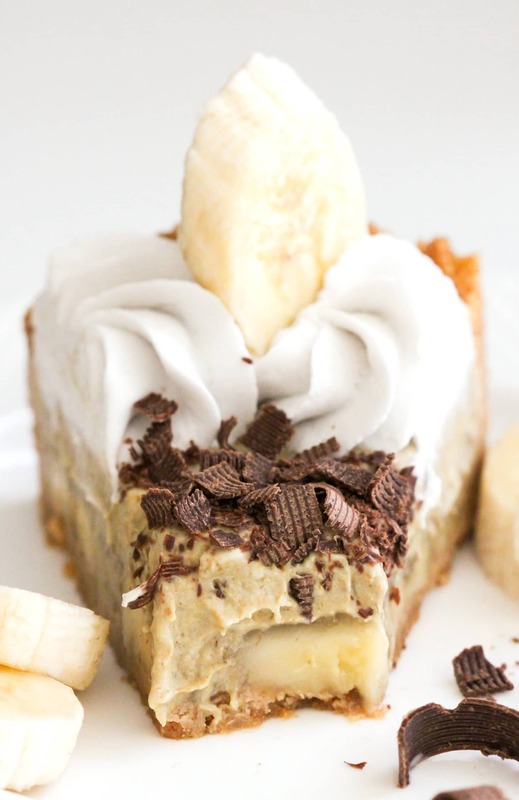 ThisHealthy Banoffee Pie has a thick crust full of graham cracker flavor, the filling is smooth and creamy with the perfect amount of banana, and the whipped “cream” is fluffy, light, and decadent! In a medium-sized bowl, stir together the graham cracker crumbs and salt. Stir in the coconut oil and butter flavor. Press the mixture into an 8" springform pan and bake for ~12 minutes. Let cool completely. Take 3 bananas and slice them into coins. 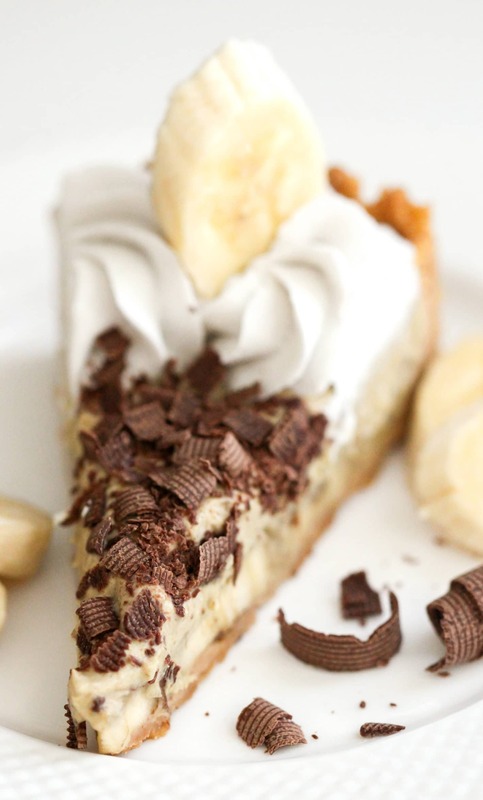 Arrange the banana coins on the crust. Open the cans of coconut milk and scoop the coconut cream into a bowl. Discard (or drink) the coconut water that's left in the bottom of the cans. Mash the remaining 2 bananas in the coconut cream. Add the stevia extract, vanilla extract and turmeric, and whisk until completely mixed in. Scoop the mixture over the banana coins and spread it out. Refrigerate for ~4 hours, or until completely set. Garnish with whipped cream, caramel sauce, and chocolate. Serve and enjoy! **I've made this pie using homemade graham crackers and storebought crackers -- both work well here! That looks amazing! I first had this when I was in Peru this summer! It was delicious! That looks so good! Pretty great that its healthier too! Omg, if it wasn’t just Thanksgiving and I wasn’t still full I would SO be making this right now! I’ll definitely have to try this soon. Thank you! Cute title and gorgeous pics! but can you please tell me what can replace the graham crackers and oat flower in the cakes? I don’t eat eggs also. I was just wondering what do you usually eat for meals that aren’t desserts? And how do you avoid unhealthy foods when you go out to parties or restaurants? Also (one last question, sorry) what’s your typical workout routine? That’s strange… maybe the code changed. Now, I think on iHerb your purchase must be $25+ for free shipping. and what is agar agar? Hi! Thank you so much for posting this! 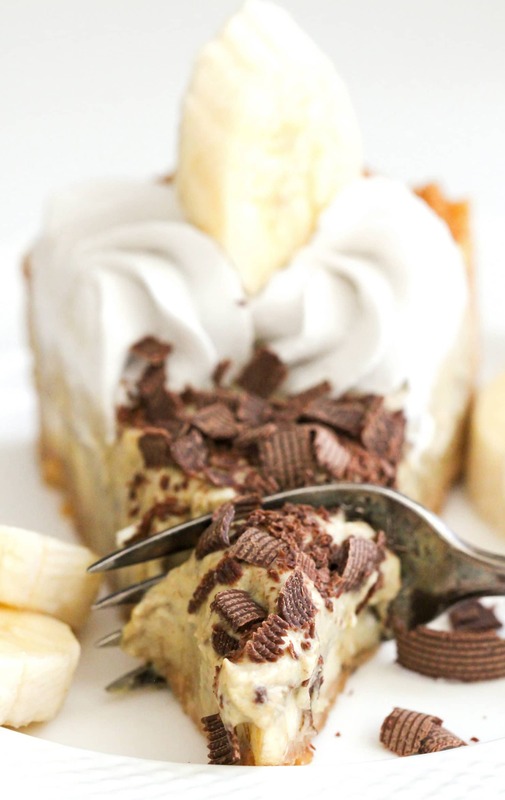 Banoffee pie is one of my favorites, and I’m so excited to be able to indulge again! Quick question for you, how long will this last? I’d love to make it the day before an event, but will it hold up? Or does it need to be eaten right away? Thank you! Hope you all like the pie! the one time i have whipping cream and not coconut milk. Is there any way to make the filling with whipped cream instead of coconut milk? would I whip it first? how much? You can try using whipped cream but I haven’t tried it so I can’t say if it’ll work or not. I would recommending whipping it first, and I would whip enough to create ~4 cups of whipped cream. Mash the remaining 2 bananas separately and then gently fold it into the whipped cream, rather than mashing the two together. This pie would probably need to be served ASAP too, as the whipped cream will lose its stabilization over time (for tips on keeping whipped cream whipped, see this post: http://www.thekitchn.com/long-lasting-wh-160614). Hope this works out for you! Also – any chance you know the gram measurement of 2 cups of graham crumbs? I ask because I will be using the crumbs of a different cookie (Petit-Beurre) and not sure how large the crumb pieces are? A fine meal? pieces? I can’t believe how simple AND guilt-free this beautiful creation really is. You’re a true miracle woman! LOVE this! Wow, that looks great! Does it have a lot of coconut taste? If I’m running short on time (read: feeling a bit lazy), what storebought graham crackers would you suggest?! If I don’t have enough time to make homemade graham crackers, I like using Mi-Del honey grahams since they’re low sugar and 100% whole wheat. If I use gluten free graham crackers, I use S’moreables. Hope this helps!